and Madame Samm our fearless coordinator! This has been yet another fun hop and spring arrived here just in time. This Hop must have been the kick in the pants it needed! just to remind us that spring was eminent, eventually. I love your beautiful bird!!! It's a beautiful bird. I tried paper piecing and it ended up a confused mess. I think it requires too much concentration....which I lack. Your bird looks perfect. Beautifully pieced birdie! What a nice little spring pillow! Love your bird pillow! I also love paper piecing. Thank you for sharing. Very, very nice pillow ! Beautiful! Love the quilting too! So cute your paper pieced birds. Love the pillow. Thanks for sharing. These paper pieced birds are so cute, Thanks for sharing! What a fabulous bird. The cushion looks lovely. That green background fabric is perfect. Great bird. What a wonderful pillow he makes. Your pieced bird and pillow are wonderful! Hats off to anyone who does paper piecing. It's not my favorite method for piecing. Nice pillow. Great pillow! So glad you were able to finish it and share it today! The pillow turned out cute. Love paper piecing. Thank you so much for being part of this hop. :) What a happy little blue bird to have perching on your bed! :) Great job!! It is so amazing what can be made using paper piecing. Your bird is so full of detail and you made a wonderful pillow out of it, nicely done. What a wonderful bird choice perched on that pillow! It seems like pattern are almost limitless with paper piecing involved, don't they? You did a lovely job on it. You did a wonderful job on your chipper little feller. I'm in awe of thoses who do PP. It's not a skill that I attempted yet. Thank you for sharing him with us. I like your bird.Very pretty. Thanks for sharing. Perfect for a nice spring day! Your paper pieced bird turned out beautifully...love it! Your sweet bird reminds me of the robins in the yard. Very nice. very cute bird, I love the paper piecing. Thanks for sharing. Love your bluebird. Great choice of background fabric. Thanks for sharing. Cute pillow! I've loved seeing all the bird projects! Fabulous! I love your paper pieced bird! Love your bird pillow! Not sure I'd have the patience anymore to deal with all the teeny tiny pieces. Beautiful! What a great job you did!! What a beautiful bird! I love your choice of fabrics. 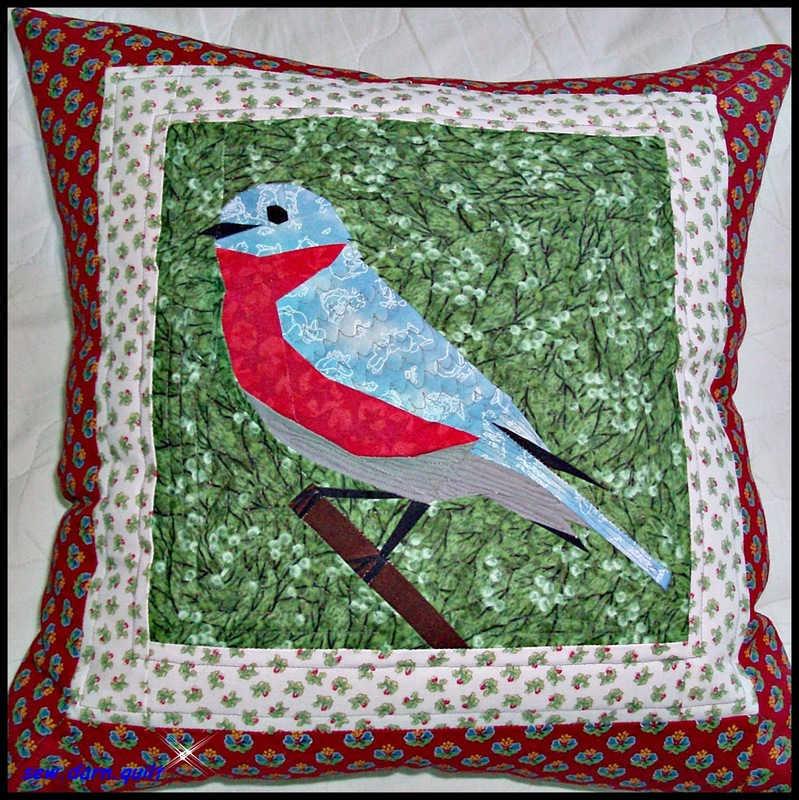 The fabrics just make the bird look so realistic in many ways. I don't have the knack of picking the right the fabrics to make my paper piecing as satisfactory as I would like. An excellent job! I am in awe! I think spring has definitely sprung here! The weather report is calling for 84 degrees by the time the Drillers start the baseball game tonight in Tulsa. The birds will be tweeting and tweeting. Of course, folks will be tweeting and tweeting, too! I'm not into that - lol. Thanks for participating in the hop and being a great inspiration. I hope to see you in another hop very soon. Bluebird of happiness because spring has finally arrived? We are looking at high 90's and possible triple digits today. Too much of a good thing. Great pillow. I am loving all these bird projects and especially the paper pieced ones. I haven't done any paper pieced ones lately. Guess I will need to get some patterns out. Very nice bird project. The colors are great. I like the detailed quilting feathers. Cute pllow - I like the bg fabric! What a great remainder spring has sprung! Lovely pillow! Thanks for sharing. Carolyn. That is a wonderful bird. You did an fantastic job and putting it into a pillow is a great way to show it off all the time! Hi!!! Very pretty!!! Love the colors you used too!!!! I really like the bird. Paper piecing is always so accurate. Great pillow. Great job. Thanks so much for sharing your Tweet with us. Oh wow .. Your bird is amazeing. Beautiful bird. Great paper piecing, too. Happy spring! Great pillow! Love your bird! 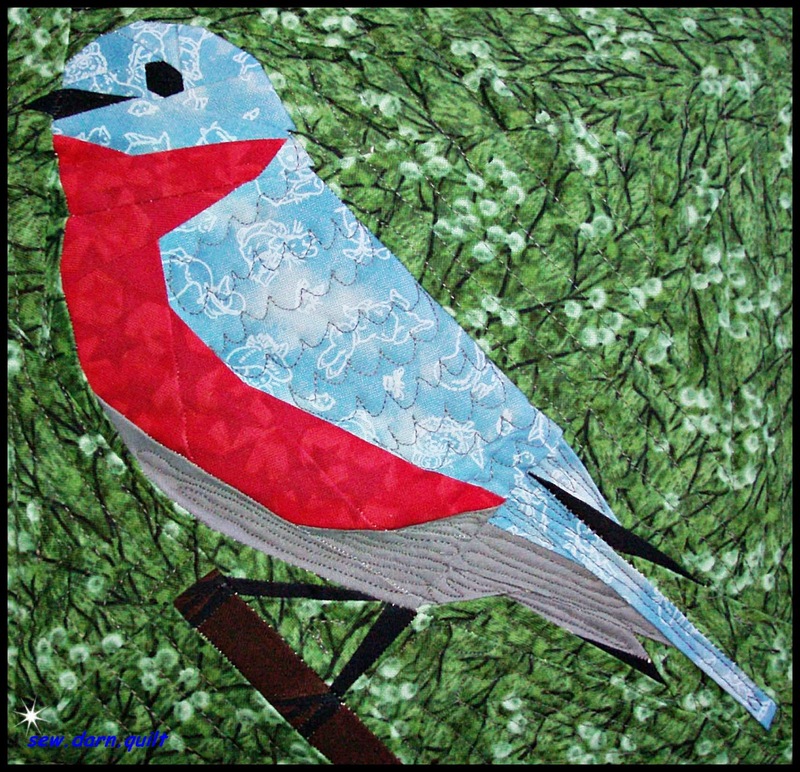 A fantastic job on your paper piecing, such a sweet little birdie! Love your pillow cover, the colours are great! What a beautiful bird! I've never tried paper piecing before. It looks complicated! Thank you for sharing!